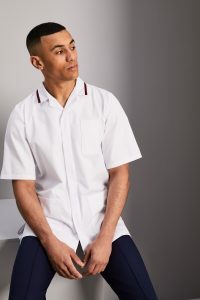 The NHS took the decision that Mental Health professionals were no longer required to wear a medical uniform such as a typical healthcare tunic or dress, as worn by other Nurses and staff in the health service. The rationale behind the change in approach was that Mental Health staff should look professional and be recognisable but not identifiable as being NHS staff. Their appearance should not be intimidating to patients, who could associate the uniform with negative feelings, and it should allow them to feel safe to talk openly. There has been an ongoing debate since the change about the need for specific uniforms. Whilst some nurses agree with the NHS’s decision, others feel it can be confusing for patients and colleagues and there needs to be some segregation between trained staff and the general public. Following the Autumn 2018 budget announcements, and a Treasury promise of an additional £2 billion of extra funding for vital improvements to mental health services across the UK, we have reflected on the debate about uniforms, as there will likely be an increase in trained professionals in this sector of healthcare. A US study conducted in 2010, by Miller,T. Mann, N & Grim, aimed to discover what type of clothing made nurses more approachable and found that whilst a lot of patients surveyed didn’t have a preference about their nurses uniform, there was a big concern about being able to identify who’s who on the wards. They found that 29% of the patients felt that nurses wearing their own clothing were less approachable. This just goes to show how important uniforms are not only for the staff but for the patients too. This doesn’t mean that mental health doctors and nurses can’t dress smartly, wearing a professional pair of suit trousers or skirt paired with a nice print blouse or shirt will keep their uniform to a high standard but will also give it a more of an approachable style. Another avenue to explore is colour, it is widely recognised that NHS staff wear shades of whites and blues in many roles and it is known that wearing colourful or print clothing can improve a patient’s perception of their doctor or nurse. We have adapted our best seller, the one button Beauty tunic, into a healthcare fabric named the Press Stud Tunic. 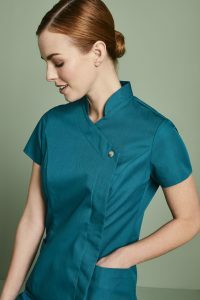 This is available in a range of colours such as plum, jade and pink, all of which are great options for Mental Health professionals, with the softened tunic styling keeping it smart without being instantly recognisable as a healthcare uniform. Simon Jersey’s healthcare uniforms are all made with infection compliant material which is key in preventing the spread of germs whilst at work. This is another thing to consider, as sticking with a classic medical uniform for staff working on hospital wards can be the most functional clothing to wear to protect staff. We would suggest that going for a uniform without a distinct logo can be a good way to avoid instant recognition. Wearing a non-medical style uniform provides nurses and doctors with the ability to visit their patients discreetly, without arousing suspicion with their neighbours or friends. For many mental health patients, it can be a taboo that they don’t want to talk about. However, the NHS has placed a huge amount of importance on opening up about mental health problems this year. If you would like to join the debate about the best approach for mental health, please comment below. You can find information here about the NHS mental health services and how to access them. To find out more about our selection of uniforms, visit our website or contact our brilliant customer services team on 03444 994414.